A number of Romanian orthodox rite historic churches in Bucharest and other places of importance throughout Romania contain ceremonial chairs, named “thrones”, dating mostly from the period of the Hohenzollern – Sigmaringen dynasty (1866-1947) destined for the use of the metropolitan/ patriarch and of the chief of state who at one time or another visited, consecrated or re-consecrated that building. The chair destined for the sovereign (there were two chairs if he was accompanied by his spouse) usually displays the cypher of the crowned head who first visited the building, assisted or gave his blessing to those important ceremonies, sometimes also containing other hallmarks of Romanian royalty, such as the crown or coat of arms. A royal or princely cypher is a monogram of the reigning ruler, formally approved and used on official documents or displayed on public buildings and other objects of public use or owned by the state, such as postal boxes or military vehicles, etc. The image above shows an interesting example of a royal chair from Mantuleasa church in Bucharest (a beautiful Brancovan style monument, restored in 1924 – ’30, in the reign of King Ferdinand and his descendant, King Carol II), photographed during a recent Historic Houses of Romania tour in that area. The chair displays Ferdinand’s cypher, a stylised back-to-back double “F”, as he was the monarch who officially inaugurated the restoration works. On top of chair’s back there is also an interesting representation of Romania’s state crown, the famous steel crown made from the melted metal of a canon captured in the 1877 Independence War. The whole assembly is rendered in the mature phase Neo-Romanian style, with ethnographic solar discs and acanthus/ vine leave carvings, constituting an interesting ceremonial furniture example expressed in the national design style. King Ferdinand’s cypher is a rare sight nowadays, the chair presented here bringing back memories of this remarkable sovereign, who strove all his life to keep a reserved and dignified public profile. This is an interesting example for Bucharest of an Art Deco style gateway that has obviously seen better days compared with the contemporary aesthetic injuries perpetrated by the ugly multitude of gas pipes blighting the casual observer’s vision and perennial lack of maintenance that it has suffered throughout the last six and a half decades since the end of the Second World War. The gateway consists of a rectangular archway with a chunky receding ends transverse bar, decorated with an apparent keystone formed from three vertical blades arranged in ziggurat fashion, and a wrought iron gate that fills in the entire arch opening. Three identical monograms of a crisp Art Deco design adorn each sector of the gate (see second photograph bellow). Last Sunday, 12 June ’11, I organised a second architectural photography tour in Bucharest, this time in Mantuleasa historic quarter. The area is mostly residential and endowed with a very diverse and exuberant period architecture ranging from beautiful Brancovan style churches dating from the late c17th to picturesque French c19th historicist and Art Nouveau architecture to flamboyant inter-war Neo-Romanian and slender Art Deco and International Modernist style dwellings, all within the space of probably less than one square kilometre. A very small sample of the architectural photographs shot during that tour are presented in the above montage. The architectural mix of Mantuleasa, although is apparently exhilaratingly chaotic, it nevertheless follows certain unwritten trends that render its architectural and social history discernible to the visitor. I trust that under my expert guidance :), the participants at the tour have thus discovered some of the more intricate architectural puzzles of this fascinating corner of Bucharest, shot excellent architectural photographs and had a nice day out! 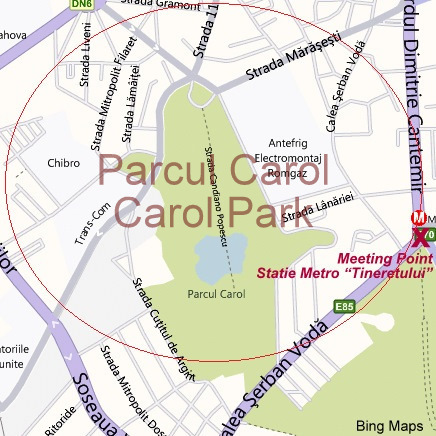 The next Sunday (19 June ’11, 9am-12.00) architectural photography tour will take place in Carol Park historic quarter, south central Bucharest (see a map at this link); meeting point: Tineretului tube station (outside southern exit, toward Tineretului Park). I look forward to seeing you there and go exploring this more than fascinating city corner!